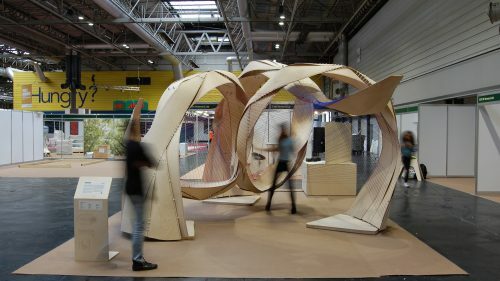 Entwine pavilion derives from an extensive research on plywood composite material systems, as well as a deeper understanding of the structural principles of tensegrity and more specifically the field of curved plywood compression members. 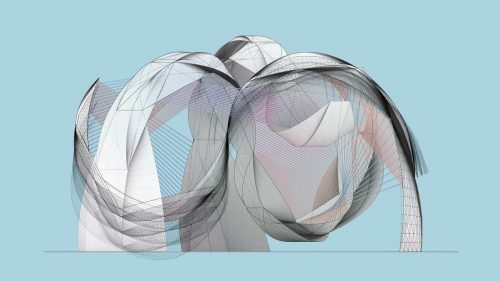 The projects’ core aim is to explore and consolidate an informed process between material performance, design and fabrication, all made possible through a constant feedback loop between computational methods and physical prototyping. 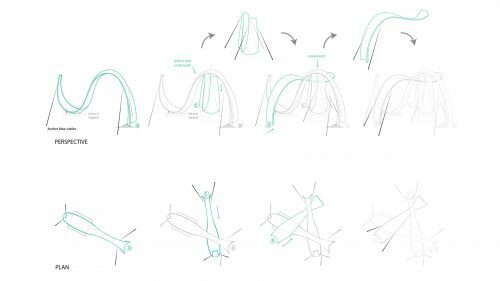 Initially, originating from the concept of tensegrity, Entwine represents a design ambition of generating volumetric spatial relationships through its tension and compression members. 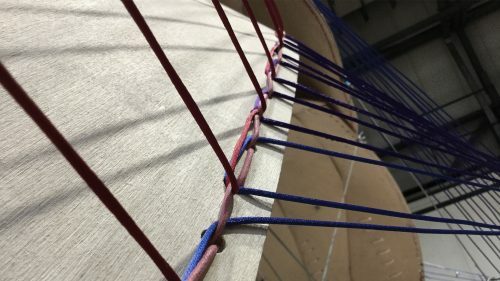 The notion of “surface” has been examined and reinterpreted in a dual manner: through the doubly curved plywood members, and the cables that connect them, the distribution and density of which brings the system into equilibrium and ensures its structural feasibility. The proposed system has posed multiple fabrication challenges that were approached via advanced computational analyses and physical prototyping experiments. Initially, the production of the curved plywood members to achieve the desired doubly-curved form was addressed. 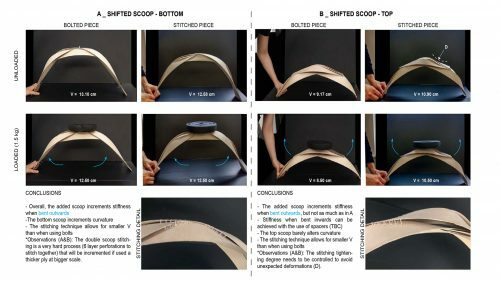 Rather than the conventional method of lamination of multiple plywood layers, the design team opted to explore an alternative system that took under consideration the direction of plywood fibers by testing textile weaving techniques on plywood. This new exploration was tested through a series of physical experiments aiming to measure and define the length, width, and thickness of the plywood sub-pieces, the curvature of the derived braided member, the difference in construction between wet and dry plywood, the advantages and disadvantages of different braiding methods (2,3,4 and 5 braided members), the length and number of braided segments (primary scoops) that would consist a whole strip, and finally the structural stability of such members under loading conditions. The completion of Entwine relied heavily on the established feedback loop information exchange between physical prototyping experiments and the appropriate computational simulations. The performance gaps that acted on 1:5 and 1:1 scale prototypes respectively, created an immediate need to devise a system of calibration and error prediction between the two scales. Computational simulation and analysis methods derived from physical experimentation facilitated the production of various quick tests in a relatively small scale and accurately predict their adaptation in the 1:1 scale. Media 10, Hanson Plywood, TRADA.